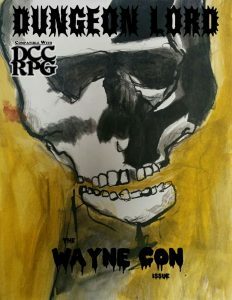 The second installment of the Dungeon Lord-‘zine clocks in at 36 pages of content, 1 page front cover, 1 page blank for autographs, 1 page b/w-photograph of Wayne Con attendees, 1 page editorial, 1 page ToC/introduction, 5 pages of Con-program, 1 page SRD, 1 page back cover, leaving us with 24 pages of relevant content, laid out in 6’’ by 9’’ (A5), which means you can theoretically fit up to 4 pages on a sheet of paper when printing this. We once more begin the pdf with a nice poem crafted by Julian Bernick – though this one, to me, reads almost like a song and might be ranked better as a sing-along, than based on poetic merit. The pdf then begins with a new race-class, the ratfolk (including a great artwork). Ratfolk gain 1d6 HP per level, are trained with blowgun, club, dagger, flail, handaxe, short sword, sling and staff and may hold up to three (!!) weapons, with the tail as the third “hand” – Ratfolk are considered to have a minimum Agility of 16 when fighting with 2 or more weapons, which means they roll at -1 die for the first attack, -2 die for the second. The tail may only grip small weapons. When fighting with two or more weapons, ratfolk score a crit and an automatic hit on any roll of 16 with hand weapons, 14 with tail weapons. An actual Agility of 16 or higher decreases the penalty, and they actually have a lower chance of fumbling – only on a total of two dice coming up as 1. Not a fan here – but they do have a downside that somewhat makes up for this: Ratfolk are notoriously unlucky. When burning Luck, they need to pass a luck check or the luck is lost. Luck is restored nightly, but only as many points as there are PCs in the party. During their turn, ratfolk can use their action to burn 1 point of Luck to declare a mishap, with the mishap die scaling from d3 to d10+4. This ability lacks a range. What’s a mishap? A catastrophic misfortune – it only happens on a 3 or higher. Action dice may be used for attacks, skill checks and mishaps, and begins at 1d20, adding 1d14 at 6th level, improving that to 1d20 + 1d20 at 8th level. Attack scales from +1 to +8 over the course of the class, and the crit die increases from 1d8 to 1d16. They always use table III. Fortitude and Reflex saves improve from +1 to +6 over the course of the class progression, while Will-saves remain bad. They have infravision, are 3 – 5 feet tall and get a scaling bonus to hide and move silently, which begins at +2 and increases up to +14 at 10th level. All in all, a decent, if somewhat lopsided race-class. The next article contains a brief, nigh rules-less microgame called DeScriptors – or rather, it provides a tweak of the pay-what-you want game. Okay two pages if you’re looking for a game with few rules. The next article provides an interview with Noah Stevens on 3 pages. After this, we get a d30-table that can be used to determine tribute to pass. Oddly, the first page of the table looks blurred, as though it hasn’t been properly scanned. After this, we get a new class by Bob Brinkman…the…*drum roll* Con-Troll!! No, I’m not kidding. Con-Trolls get 1d6 hit points per level, and they believe themselves to be trained in all weapons. They’re not. They’re untrained. They begin play with 1d20 action die, which may be used for attacks or spell-checks, with 5th level unlocking the second action die, which only may be used for fandom checks. What’s that? Well, at 1st level, you choose a known fandom, with every 3 levels thereafter providing an additional fandom. Con-trolls only increase Ref-saves to +3 over their 10 class levels, but do get up to +10 on Will-saves…but to make up for that, their Fortitude save never improves. Their bonus languages must be chosen from ones that almost no one speaks (like Mandarin Klingon o the French dialect of brontosaurus), and their attack value increases to a paltry +3. They get a 1d3 crit die, which improves to 1d10 over the course of the class, and the table remains I. We get titles for the first 5 levels, with different titles provided for chaotic and lawful con-trolls. The main meat of the class, as noted, would be fandoms. These are evoked by making an obscura check – 1d20 + Personality + fandom level. Thing is…fandoms have no levels. I think that probably should be the con-troll level. On a roll of a natural 1 on such a check, the con-troll must roll on the nerd-rage table, and plenty of fandoms are provided, each of which can have different manifestations (7 provided per fandom): Grognardia covers tabletop games, but we also get historical reenactment, anime and Star Trek (only d5 manifestations here). They all have their own table akin to spells in formatting. The con-troll class…is genuinely funny and cool. It’s actually playable and has some neat, tongue-in-cheek abilities. Big kudos to the author!! After aforementioned program guide, we have a brief one-page teaser for the ravaged lands setting, before we get 6 pregens, all of which come with a nice piece of b/w artwork. The final piece of content is a per se cool encounter: “Blood Shed of the Necro-Butcher” by Wayne Snyder, but it loses some of its appeal due to a) lacking stats and b) once more suffering from being somewhat blurred due to a scanning issue or the like. Editing and formatting range in quality, depending on the article in question. Generally, the formal criteria are better than in issue #1, but rules language precision fluctuates. Layout adheres to a one-column b/w-standard, and it should be noted that the ‘zine sports some rather nice b/w-artworks. Unfortunately, the ‘zine has no bookmarks, which makes for an annoying comfort detriment. This issue of Dungeon Lord, penned by Taylor Frank, Julian Bernick, Matthew Bannock, Bob Brinkman and Wayne Snyder, is a step forward from the first installment. It is still not as refined as I’d like it to be, but it is tighter and more professional in its presentation – but due to being con-focused, it also sports quite a bunch of pages that won’t matter much to you anymore. All in all, this would be barely a 2 stars offering, as I probably wouldn’t have gotten this a second time…were it not for the con-troll class. While not perfect, it is a genuinely funny and functional class that made me smile, and it represents the one reason to get this pdf. If you’re interested by the class, this is worth getting. If not, then I’d advise in favor of getting another ‘zine. The con-troll thus make me increase my final verdict to 2 stars. You can get this ‘zine here on OBS. If you found my reviews useful, please consider a donation. If you enjoy my reviews, please consider supporting my Patreon campaign!